Forty high school students from the Rochester City School District will graduate Saturday after completing the Future Business Leaders and Entrepreneurs program. 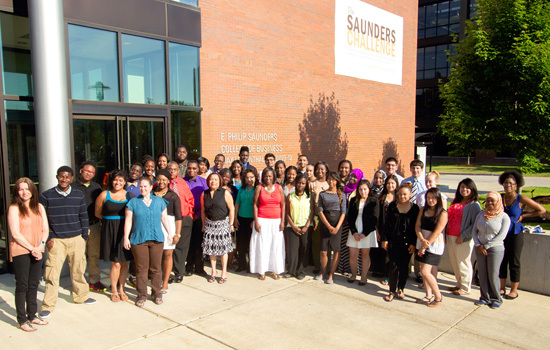 Forty high school students from the Rochester City School District—East High, Edison, Benjamin Franklin, Wilson Commencement and School of the Arts, among others—will graduate Saturday after completing an unconventional summer school program at Rochester Institute of Technology’s Saunders College of Business. The apprentices have been attending the Future Business Leaders and Entrepreneurs (FBLE) program the past 10 weeks—analyzing data from six Rochester-based companies to develop cost-effective, practical solutions the companies can implement to solve their business challenges. Results of their findings will be presented from 10 a.m. to 2 p.m. Aug. 16 in Max Lowenthal Hall at RIT. FBLE is under the helm of the business school’s Center for Urban Entrepreneurship (CUE). Since its inception in 2009, more than 140 RCSD students have completed the program, and more than 90 percent of participants said the program increased their abilities to speak and present in front of a group, take on difficult challenges, problem solve and work as a team. For more information about the Future Business Leaders and Entrepreneurs program, contact CUE Program Manager Ebony Miller at 585-475-6092 or go to rit.edu/cue.